The Ideal 1038 is a very popular trimmer and has a resharpenable high-quality blade set made of "Solingen steel" a solid manual clamp for variable pressure. Precision side lay with measuring scale (mm/inches) and adjustable backgauge and a lockable front gauge with integrated narrow strip cutting device for cutting of strips as small as one mm the front gauge is adjustable via a calibrated rotary knob. There are fold-away paper supports on front gauge and standard paper sizes indicated on the table. An automatic safety guard made from transparent unbreakable Lexan (guard rises and falls with the movement of the blade1) solid cast aluminium blade mounting bracket with double pivot bearings for blade axle made of solid all-metal construction. There is a short video on the IDEAL 1038 trimmer further down this page. 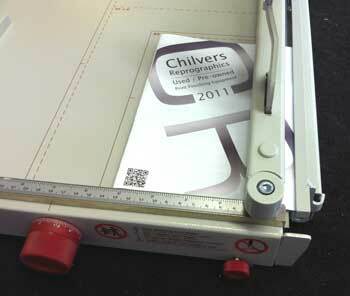 The Ideal 1038 is also an ideal fast and easy way for trimming the front edge of stapled and folded booklets. Lots of printers find this quicker than using a electric guillotine due to the problem of trying to stack up the booklets under the guillotine clamp.